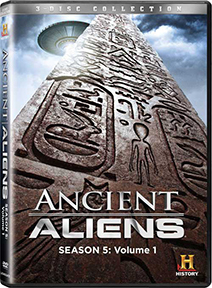 Disc 1: "Secrets of the Pyramids"; "Aliens and Cover-ups"; "Alien Power Plants"; "Destination Orion" + the following Trailers: "Mountain Men"; "The Darkest Hour"; "Swamp People"Disc 2:"The Einstein Factor"; "Secrets of the Tombs"; "Prophets and Prophecies"; "Beyond Nasca"Disc 3: "Strange Abductions"; "The Von Daniken Legacy"; "The Viking Gods"; "The Monoliths"
ANCIENT ALIENS SEASON FIVE VOLUME 1, 3-DVD Set. 360 Minutes. 3 DVDs in Box. Extras.